There are 2 weekend dates to keep in mind for the spring, if you are interested in seeing Luna Jaze and all of my new designs for Luna Jaze Bags: April 29,30, and May 1, 2016; May 13,14, and 15, 2016. Maryland (my fav state!) State Fairgraounds, Timonium, Md. is hosting the Sugarloaf Craft Festival, and I will be there, 04 29 16 through 05 01 16. Pennsylvania Guild of Craftsman, which supports art education, craftsman, and small arts backed business owners, is sponsoring a fabulous show in Philadelphia at the historical Rittenhouse Square Park in Center City. Luna Jaze will be on Walnut St. Please support the Arts by your attendance, its such a civilized thing to do. Luna Jaze, a little info for the cold months. Its been a while since I’ve posted anything on my blog. You think that after the children leave home, that you will have all of the time in the world to do the things that you want to do: wrong! Life seems to be busier than ever. I had several successful shows this summer, and early fall, and want to thank you all for your wonderful support. These events were followed by my daughters wedding, which was fabulous, but took up a lot of time. The confluence of the wedding, lack of purse production, and a stray heath issue, seemed like a good time to take a fall and early winter respite. Regretfully, I will not be attending the Pennslyvania’s Gruild of Craftsmans show at Rittenhouse Square, in Philadelphia, this weekend, and I will not be attending the Surgarloaf show in Baltimore this month. I have decided, during this lag time, to have the knee surgery that has been long over due, and greatly needed, and will be back in the late winter with a little kick in my step, just in time for my next show the ACC retail show in Baltimore in late February, which I am very excited about. Stay tuned for new designs and information on the event. I will miss you all and hope to see you in Baltimore in 2016! Life can be so very busy, cant it? I am not unlike anyone else, there just aren’t enough hours in the day to do all that we want to do. Since Luna Jaze is a one man (woman) show, my days tend to be long, but very satisfying. As with all art, designs change and evolve as one works. The more one works, the more things change: the evolution of Art. This coming year I have concentrated more on design, bringing each bag to its full potential in leather. Designs are different, with different combinations of leather, and with more interesting accents. My season is a busy one and I hope to catch you at one of my events. Along with the show season, I will be teaching some leather workshops at Touchstone, in Farmington Pa., and at The Center for Contemporary Crafts, in Pittsburgh, Pa. If my days weren’t busy enough, I’ve taken on the task of making my daughters wedding dress! Its a good thing that I love to sew! Dates to Remember in chronological order. Please go to the website for the details. June 20-21 Center for Contemporary Crafts, Pittsburgh, Pa.
July 9-12 Penn State Craft Festival, State College, Pa.
July 27-31 Touchstone Center for Crafts, Farmington, Pa.
September 11-13 Craftsmans Guild of Pittsburgh, Pittsburgh, Pa.
and always remember the I Made It Markets in Pittsburgh for great Crafts. Hope to see you all at one or all of my events, its going to be a crazy busy season, but it will be a lot of fun. Ring in Fall with Luna Jaze in Maryland! Luna Jaze is excited to invite you to the Sugarloaf Crafts Festival in Timonium, Maryland! Please join us and over 250 artists and artisans at the Maryland State Fairgrounds next weekend, October 10-12, 2014, for this fantastic display of art and craft. There will be great food and music to compliment the varied artists as well as special kids’ shows and interactive demonstrations with master craftspeople! It is surely a show you won’t want to miss! Its going to be a really big show! September is one of the loveliest times of year in Pittsburgh. We have over 2000 acres of park lands within the city limits in which one can enjoy the cool nights and crisp, woodsy perfumed days. 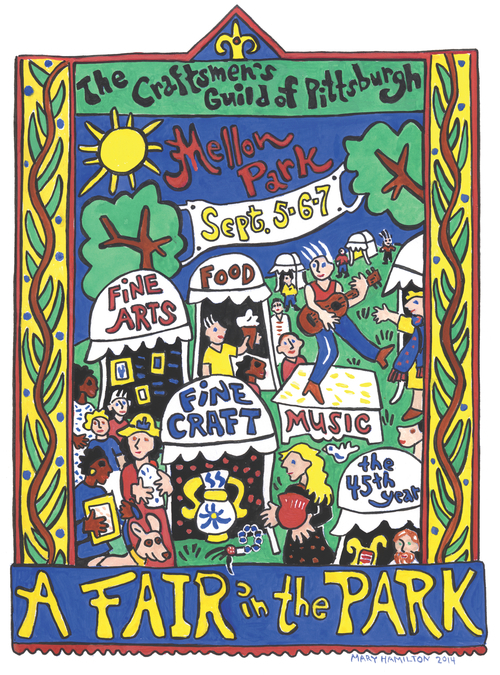 Mellon Park, with its walled gardens dating back to the gilded age, is hosting the Craftsman’s Guild of Pittsburgh’s 45th Anniversary Arts and Crafts Show, “A FAIR IN THE PARK”. Historically, 20,000 people support 100 regional and national artists specializing in clay, fiber, wood, jewelry, glass, metal, leather, photography, mixed media, and two-dimensional art. Join Luna Jaze and other artists to celebrate The Craftsman’s Guild 45th Anniversary show. There will be great food and music to compliment the varied artists at “A FAIR IN THE PARK”, located in Shadyside’s beautiful Mellon Park, September 5,6,7, 2014. Only 2 weeks away from the Central Pa. Festival of the Arts, located in beautiful downtown State College, in Happy Valley. Sidewalk artist and performers will be located and throughout the University Park of Penn State Campus and in the downtown area. The arts festival is one of the nations finest and will be running from July 10-13, 2014. There are events for everyone; fabulous artist from around the country, great food and international music performances. Central Pennsylvania Festival of the Arts, aka Arts Festival, brings over 100,000 people to State College and Penn State each July to celebrate the arts!